I am a Spudman. Yesterday, I competed in the Spudman Triathlon, which was my first triathlon of the year and my first try at the Olympic distance. I was a little disappointed in my results. I had hoped to finish with a time between 2 hours 30 minutes and 2 hours 45 minutes. I had it all figured out. Swim the 1.5 K in 28 minutes, ride at a 20 mph average, and run at a 8:30 minute/mile pace, then I would finish right where I was hoping. 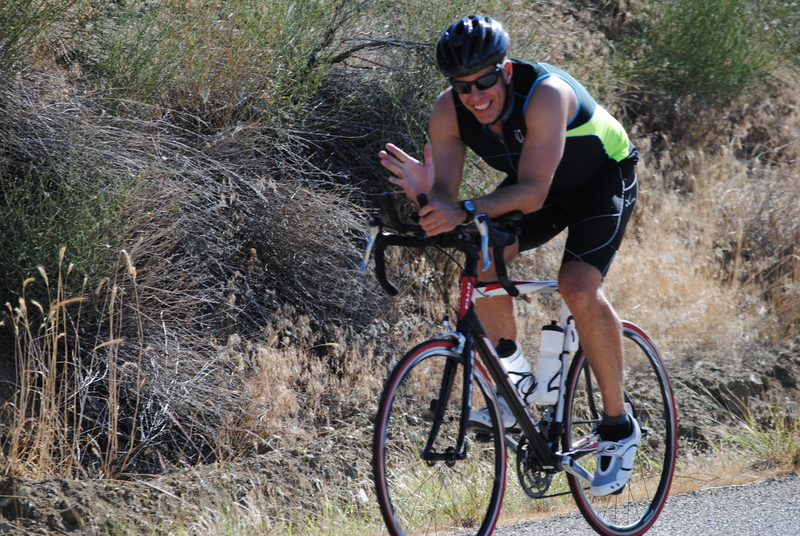 My race did not turn out as I had envisioned it in my head. 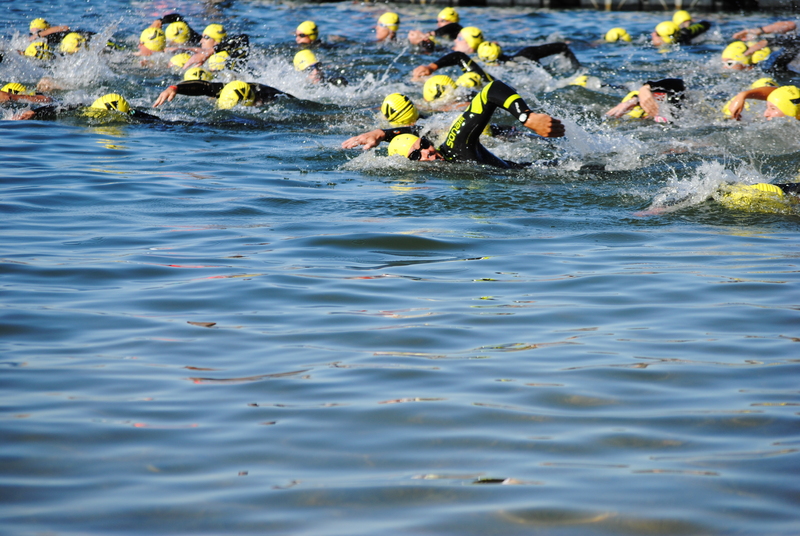 My mind pictured me gliding through the water with the race leaders. I saw myself flying up the two big climbs like I was in the Tour de France. The visualization was to conclude with me running like a gazelle along the Boise River. In reality, I finished at 2 hours, 51 minutes, 37 seconds. As usual, I was right in the meat of the race bell curve; The Meat of Average. I did not swim with the race leaders. I was jostled about with swimmers all around me throughout the swim. I emerged from the water after 31 minutes, 17 seconds. However, I swim 1.6K in a 25 yard pool at around 32-33 minutes. Therefore, my swim was right about what I average in training. The professional cycling teams will not be seeking to take me to the Tour de France next year. The two big climbs of the course humbled me to 8 mph. I made up time on the descent and the flats but the climbs were brutally long stretches and my average speed was only 18.7 mph. However, I finished a similar hilly course two weeks ago and averaged only 17 mph. Therefore, my ride was right about what I average in training. The tranquility of the Boise River Greenbelt was not sufficient to transform me from an ox into a gazelle. I plodded along as other competitors continually passed me and I passed no one. There were so many familiar faces that I had raced past on the bike only to see them gracefully stride past me on the run. It was depressing as I labored in at a 9 minute, 14 second per mile average. However, I normally run a 10k just under 9 minutes per mile. When you consider that I had just swam 1.5K and cycled 25 miles, my run was right about my training average considering my tired legs. Race day expectations should be guided by everyday training experience. There was nothing in my training that supported my vision of 2 hour, 30 minute finish time. However, that had not prevented me from creating all of these justifications for why my race day expectations would be different from my training experience. There are many people who are discouraged by how they respond to temptation. They wonder how they could get caught up into something so completely of the flesh. It seems to me that many folks have expectations of responding well to big temptations that the experience of their daily spiritual walks’ do not support. It should not surprise us that we fall when we are not regularly and consistently walking by the Spirit and setting our minds on the things of the Spirit. it comes from habitually allowing our minds to linger on the sensual and lust. it comes from allowing our selfishness to regularly be irritated for not getting what it wants. they come from a pattern of compromise and justifications. they come from years of pride and a refusal to reconcile. Most of us want to think that we will never do those “big” sins. What is your confidence built upon? Is the confidence of victory over temptation based on hopeful speculation or experience? How is your training been going? Does your daily walk support your expectations? There are many folks who expect a spiritual response when their path has not been of the Spirit. They expect godliness when their minds have been languishing in the godless. Our daily walk in the Spirit is a good indicator of how we will respond to those bigger challenges of our faith. We need to have realistic expectations. This is no place for speculation. If your daily walk in the Spirit is not what you know it should be, then do something about it. All of our minor flubs and foibles do matter because they show us where our minds are set. Those mis-steps should not be merely dismissed and justified. They should turn us back to our Lord and Savior in repentance, love, and a desire to follow Christ with our whole heart. We can face temptations with confidence when we face them through the power of the Spirit. Let’s make sure that we are actually living in the power of the Spirit. Let’s run this race of life with realistic expectations based on the joyful experience of being daily trained by the Spirit himself. PRAYER: Lord, you know that I want to persevere to the end. You know that I want to run well. You also know that I am very weak. Father, help me; fill me with your Spirit and help me to set my mind on the things of you. Lord, I need your help to walk in the Spirit. Thank you for helping. I pray this in the precious name of your Son, Jesus Christ. Amen.